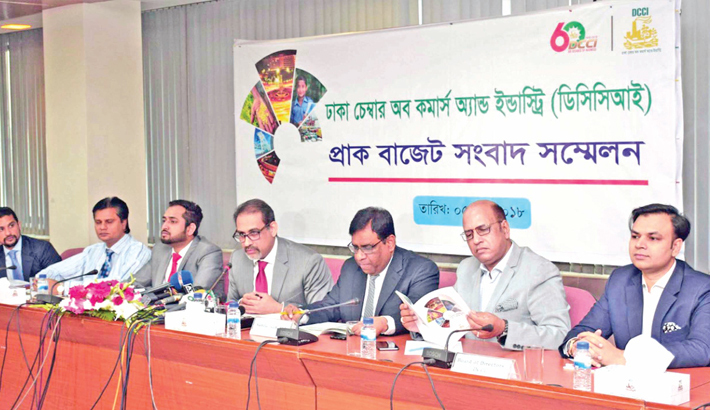 Dhaka Chamber of Commerce and Industry (DCCI) President Abul Kasem Khan speaks at a pre-budget press conference in DCCI conference room in the capital on Saturday. The Dhaka Chamber of Commerce and Industry (DCCI) on Tuesday urged the government to cut the existing corporate tax rates and increase the income tax thresholds in the ensuing budget for fiscal year (2018-2019). The chamber made a set of proposals at a pre-budget meet the press at the DCCI auditorium in the capital on Saturday. DCCI President Abul Kasem Khan reads out the proposals, while its Senior Vice President Kamrul Islam, Vice President Riyadh Hossain, Directors Andaleeb Hasan, Md Alauddin Malik, SM Zillur Rahman, Imran Ahmed, KMN Manjurul Hoque and Secretary General AHM Rezaul Kabir were present. Abul Kasem Khan said the government should gradually decrease the corporate tax rates for different companies in phase-wise in next three budgets by 5 percent, 7 percent and 10 percent, respectively. He proposed for lowering the corporate tax for listed companies to 20 percent from existing 25 percent, for non-listed companies to 30 percent from the existing 35 per cent and for merchant banks to 32.5 percent. Corporate tax for listed banks, insurance and non-bank financial institutions (NBFIs) should be slashed to 35 per cent from the existing 40 per cent in the next national budget, for non-listed such companies to 37.5 per cent from 42.5 per cent in the next national budget, for listed telephone operator to 35 per cent from 40 per cent in the next national budget, and for non-listed mobile phone operators to 40 per cent from 45 percent and for listed telephone operator to 35 per cent from 40 per cent in the next national budget. DCCI president said that ‘such type of reduction in corporate tax will give confidence to the companies to expand their businesses with fresh investment while it will also encourage them to pay tax properly.’ ‘Government can given condition with reduction in corporate tax for expansion of their businesses with fresh investment and creation of employment opportunity’, he added. About tax-free income limit, the DCCI president recommended NBR to raise the threshold to Tk 300,000 for individual taxpayers from the existing Tk 250,000 considering the increased cost of living. They also proposed for raising the tax-free income threshold to Tk 4,00,000, for women and senior taxpayers from the existing Tk 300,000, Tk 4,50,000 from Tk 4,00,000 for disabled taxpayers and Tk 4,75,000 from Tk 4,25,000 for gazetted war-wounded freedom fighter. The chamber also made a call to reduce the highest income tax rate to 25 per cent from the current 30 per cent. Besides, Abul Kasem Khan proposed for raising the ceiling of surcharge-free net wealth to Tk 5 crore from the existing Tk 2.25 crore in the budget for FY 2018-19. He said the government should continue the package VAT to ensure transparency and accountability in VAT collection. The DCCI also demanded for increasing VAT-free annual turnover limit to Tk 1 crore 20 lakh. DCCI President also urged the government to provide Smart VAT tax cards like Tax Card for VAT payers to ensure transparency and accountability in VAT collection. Among other proposals, the DCCI recommended the government for imposing 10 percent tax on dividend income instead of current 20 percent.